Set the table with pieces of history. Each stainless steel utensil carries with it the tradition of quality originating in Laguiole, France in the 19th Century. Crafted entirely of stainless steel, polished to a sheen. All bearing the famed Laguiole "bee" symbol. Set the table with pieces of history. Each stainless steel utensil carries with it the tradition of quality originating in Laguiole, France in the 19th Century. Crafted entirely of stainless steel, polished to a sheen. All bearing the famed Laguiole "bee" symbol. Dishwasher safe. Comes in a beechwood gift box. Crafted in 18/8 Stainless Steel. I purchased this service for twelve for Wine Enthusiast several years ago and have used it daily. I have two complaints - one, the tablespoons are quite large (almost serving size) and the teaspoons are very small. Wish they made a soup size spoon for cereal, etc. My major complaint is that the handles on this flatware are falling apart. The handles are comprised of 5 pieces - the main utensil, two pieces of resin, and two stainless steel pieces that cover the resin in the handles. The stainless steel pieces covering the resin keep detaching from the resin on a regular basis. Super glue fixes the issue for a few weeks, but not always. And if the resin breaks - which it does as it is quite brittle - there is nothing left to glue to. This stainless steel set is cheap and light. It is definitely NOT worth the money spent for it . Woe is me.. I bought 2 sets. Buyers remorse. I own and love the Laguiole cheese knife set, and was excited to find the flatware set (which I purchased as a Christmas gift), which has the trademark bee and is a very nice shape. However, I was extremely disappointed at the weight and overall look: the pieces were very light weight, the material appeared thin and poorly manufactured, and they were not very sturdy and easily bent. I plan to return this product and stick with the cheese serving set from this manufacturer. I was a touch disappointed. They are nice, but I was expecting the next level up with nicer quality and prettier detailing. It was not clear in the pictures. If you are looking for a nice daily set of utensils do get them. They seem to be durable and they are dishwasher safe which is a plus. I order a set of 12 place setting and these are amazing. Everyone I have entertained loves them too. 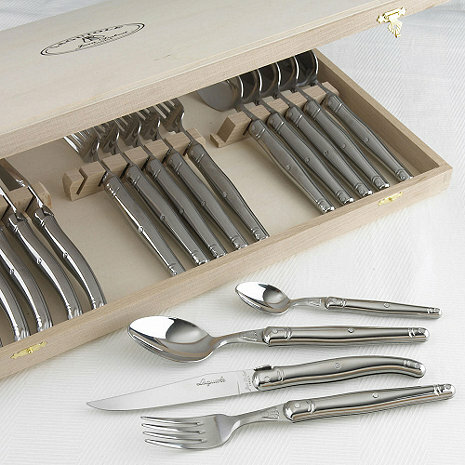 Very high quality flatware and Made in France. Beautiful design, feel and look great! Spoon sizes are a bit odd but I love this set nonetheless. Elegant yet okay for daily use.